Hip hip hooray... am so happy with those angels.... keep moulding and moulding.... I finally managed to make them with lower lips. Would like to thank Donna for her trust to let me decide on colour and design of this cake. I would like to apologies to some of you that I've delayed in responding your emails... am still try to reply all of them, please bear with me. Thanks for your understanding. 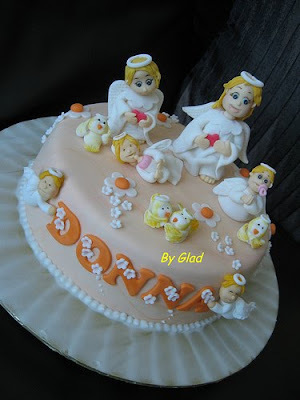 wow, this is very very very beautiful!Can teach me how to make those angel?